The United States of America began as a radical experiment in democracy. Georgia's gubernatorial election offers a high definition view of the way things work today. Democrat Stacey Abrams and Republican Brian Kemp are polling inside the margin of error among likely voters. Does that say more about the people's split intention or the state's long history of vote-suppressing innovations? It's worth remembering that the home of Martin Luther King also incubated the conditions he fought against. Too much is still the same today. Morehouse College's Fredrick Knight points out that black voter suppression -- sadly "a southern tradition" -- still flourishes. With regard to this particular election, he recently wrote that "from Georgia’s voter registration scandal to gerrymandered districts that dilute minority voting power, millions may be shut out of November’s midterms." [T]he state Legislature altered the boundaries of House districts in Gwinnett and Henry counties, according to a recent federal court ruling. The districts were redrawn by the Republican-controlled Legislature to exclude neighborhoods that usually voted for Democrats, which helped ensure the re-election of two Republicans: state Rep. Joyce Chandler and former state Rep. Brian Strickland, who is now a state senator. The state's election infrastructure is also subject to unintentional errors. It relies on unauditable machines which are at risk of being hacked. A recent ruling concluded that the state's election officials - led by Republican candidate Brian Kemp - have "buried their heads in the sand" with respect to these crucial risks. And it seems, to the basic needs of a free and fair election. MARIETTA, Ga. — Wim Laven arrived to his polling location in Atlanta’s northern suburbs this week unsure what to make of recent allegations of voter difficulties at the ballot box. Then he waited two hours in the Georgia sun; saw one person in the line treated for heat exhaustion; and watched a second collapse, receive help from paramedics, yet refuse to be taken to the hospital — so he could remain in line and cast his ballot. Mr. Laven is now a believer. I suggest you join Mr. Laven in believing that the Georgia Peach is at risk of rotting. The good news is that Stacey Abrams is magnificent. Electric enough to remind a cynic we're all made up of star stuff. Human enough to lead with empathy. 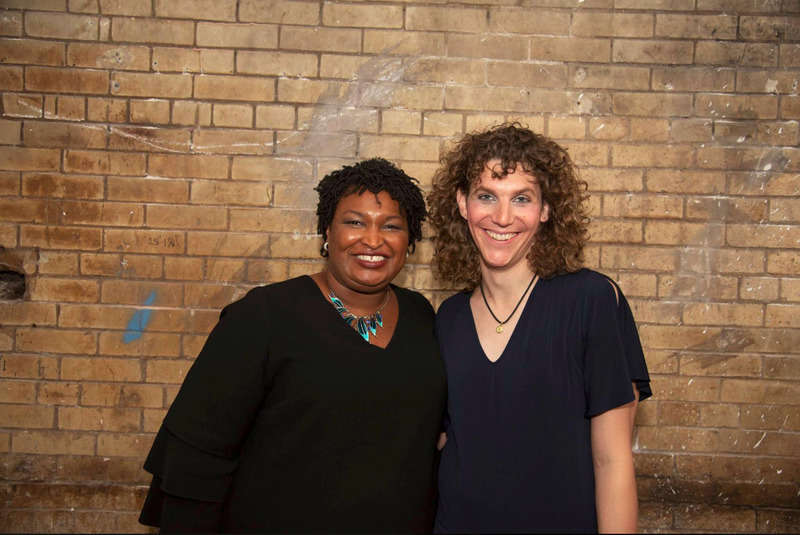 She'll be Georgia's next governor if all the votes are counted on November 6th. I hope that happens, and not only because the candidate gives a great side hug (see below).